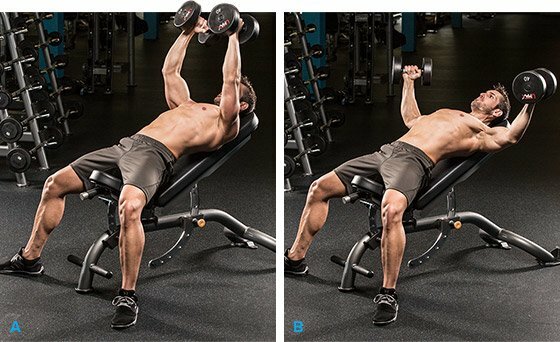 To more fully work your pecs, start using multiple angles on the incline and decline bench! Every seasoned iron warrior knows that to build a big chest, you have to work the pecs from all angles. Even beginners include flat bench, incline, and decline movements in their chest routine. That&apos;s great—if you want to progress like a beginner. But you&apos;re probably seeking more advanced development, so your plan of attack should be more sophisticated. How do you get more advanced than hitting the three major bench angles on chest day? By using an adjustable bench and working those in-between angles. Benches used with barbells usually offer only one fixed position, but an adjustable bench allows you to try a number of bench settings between flat and the 45-degree incline—at about 15 and 30 degrees, and their decline counterparts. You can do incline presses at angles approaching 90 degrees, but steeper angles work the delts more heavily. "Muscles are comprised of tens of thousands of fibers that run along the line the muscle pulls, but they don&apos;t always run parallel to one another or the entire length of the muscle," says David Sandler, CSCS*D, Director of Science and Education for iSatori. "For muscles that perform several functions and pull in different lines—such as pennated muscles like the pecs—exercise variations must be performed to activate all of the fibers. "A particular exercise or angle of an exercise might not stimulate all of them, at least not maximally. As the angle increases, it changes the fiber activation pattern. Using the same angles in your chest workout—say the same fixed benches on incline and decline movements—may not even hit some fibers. That&apos;s why I&apos;m a strong proponent of target training muscles at multiple angles to ensure every muscle fiber is activated." When designing a workout to take advantage of multiple bench settings, the barbell bench press is the first to go because the bars and benches are fixed in one position. But that still leaves you with dumbbell presses and Smith machine presses—both rely on incline or decline adjustable benches. You can take the same approach with your dumbbell flyes. If you prefer pulleys, change the height of the pulleys on a cable apparatus to alter the angle of pull from one set to the next. "When you alter the angle on four sets of four exercises, it&apos;s almost like performing one set of 16 different exercises," says Sandler. "Doing angles you&apos;ve never tried—even when completed on a common exercise—are almost like brand-new movements altogether. "When you alter the angle on four sets of four exercises, it&apos;s almost like performing one set of 16 different exercises." "You can also focus on strength by choosing heavy weights for sets of fewer than six reps, or use moderate weights and reps (sets of 8-12 reps) to concentrate on building muscle size. This small-angle approach is compatible with whatever goal you may have." 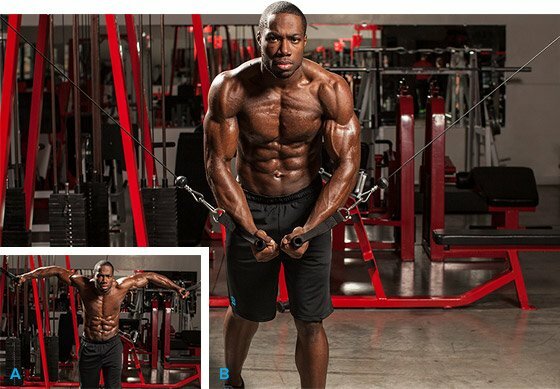 The Small Angles for Big Gains Chest Workout centers around four basic chest moves—two multi-joint presses and two single-joint flyes—in which each set is slightly different from the others to work the pecs in ways they haven&apos;t been worked before for more complete overall development. Do this multi-joint movement early in your workout when energy levels are highest. Dumbbell bench presses are great for building size while also involving synergistic muscle groups. With dumbbells, you can also get a slightly longer range of motion than you do with a barbell. Start with the bench in the flat position; after 1-2 warm-up sets (not done to muscle failure), do four working sets, increasing the angle of the bench one notch—about 15 degrees—after each working set. Most lifters can bench more at lower inclines than higher ones, so you may have to drop the weight a bit on the last set or two. Without having to balance the weight—the movement is locked in the vertical plane of a Smith machine—fewer stabilizer muscles are involved. The Smith machine may allow you to train heavier than you could with a barbell. However, the key is adjusting the bench to the precise location. If you change the bench angle from one set to the next, you&apos;ll have to roll the bench forward or backward an inch or two relative to the bar to ensure it approaches your pecs in just the right position. Rehearse with a light weight on each set to determine the exact location. 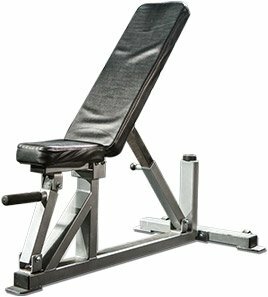 While this can also be done using an adjustable bench working the flat-to-incline-bench positions, if your gym has an adjustable decline bench, opt for that to work the middle to lower pecs from various angles. Start from a position that most closely approaches the flat bench and progressively increase the degree of decline from one set to the next. This single-joint exercise requires that you lock your elbows in the slightly bent position throughout, which therefore focuses primarily on the pecs without the assistance of secondary muscle groups. Because you have to use less weight, it&apos;s best done toward the end of your workout. You started the first dumbbell exercise going from flat to incline, so reverse the progression here. Do your first set at about a 45-degree angle, then lower the bench position one notch on each successive set. This is another single-joint exercise for chest, but since cables come from the sides, the angle of pull is altogether different. Using upper-pulley positions, the focus is on your lower pecs to complement the mid- to upper-pec focus of the dumbbell fly. The same rule applies here: Keep your arms locked in the slightly bent position throughout the range of motion to ensure the pecs do the work. With the pulleys in the upper-most position, use a split stance centered between them, extending your arms to the sides. Lean forward, then contract your pecs to pull—not press—the handles toward your midline as you would hug a giant barrel. Lower the pulleys one position on each of the next three sets. So there you have it—a chest workout that takes you beyond the regular incline, flat, and decline movements that may be leaving your growth stale. The pecs are a complex group of muscles, which require a different approach than many others to maximize growth and balance. Make sure you hit the right volume, proper angles, and correct rest, while focusing on intensity and form to maximize your growth and balance in this muscle group. This workout makes small changes on each set within the exercise listed. After your warm-ups, it progresses from heavy weights and low reps on your first exercise to moderate weights for higher reps, thus working multiple relative intensities as well. Toward the end, the higher reps help pump the muscle. When training for muscle size, keep rest periods to 60-120 seconds (the longer interval corresponds to the multi-joint exercises). Angle refers to approximate degrees from the flat bench position, or simply adjust one notch up (+) or down (-) on the adjustable bench at a time. On the cable crossover, refers to notches from the top position. Excludes warm-up sets; do as many as you need but never take warm-up sets to muscle failure. Choose a weight so you reach muscle failure by the target rep.
Intense training burns up stored carbohydrates (glycogen) which power your workout. Levels of the catabolic hormone cortisol also quickly rise as your session progresses. That&apos;s why nutritionists advocate a post-workout meal immediately after a training session. The meal should consist primarily of a fast-digesting protein (usually whey) and high-glycemic carbs. The question then arises: Can you get an even faster delivery of these critical nutrients by ingesting your post-workout meal before you lift? Research supports that ingesting a mixture of about 40 g of carbs and 40 g of fast-digesting protein will not only aid in fueling your workout, but will leave some of those nutrients in your bloodstream to begin the recovery process. In this instance, your post-workout meal can actually be consumed pre-workout! For an anabolic kick, your post-workout cocktail taken pre-workout should also include other substances that might normally be taken post-workout as well, including creatine monohydrate, BCAAs (such as iSatori&apos;s new Amino-Amp which contains high levels leucine, isoleucine, valine, and MethioMax) and bio-active peptides such as Bio-Gro. This is on top of what you might normally consume pre-workout, such as nitric oxide, beta-alanine, a testosterone booster such as iSatori&apos;s new Isa-Test DA3, or a stimulant-based pre-workout supplement. Including these ingredients in your pre-workout drink doesn&apos;t take the place of your regular post-workout meal; Eat that meal as you normally would. Go for a fast-digesting protein and iSatori&apos;s Bio-Gro containing bio-active peptides to ensure you get a jump on the anabolic (or muscle-building) activity. Also try the ingredients listed above and a fast-digesting carbohydrate (like dextrose) to spike insulin levels. Never diet again by incorporating these 10 can&apos;t-miss strategies for permanent weight loss. You&apos;re looking to transform, not evolve. You have time, but not forever. Follow these 10 tips and speed up your progress. Let&apos;s go! Don&apos;t get so wrapped up in losing fat that you forget about muscle. It&apos;s the real key to a successful, lasting transformation!